This image was taken in August 2000, according to the Historic Architectural/Archaeological Resources Geographic Information System, although based on the cars, it looks a good decade or so older. My guess is it was taken in the late eighties or early nineties. 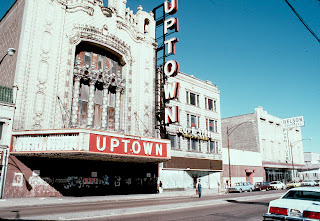 The first Uptown Community Portrait, below, was taken in 2000, and the vertical marquee on the Uptown Theatre is missing. I'll have to double-check the date that was removed. In any case, it's amazing how different this stretch of Broadway looks now with Annoyance, FatCat, Marigold, and other businesses opening up. Change always seems to happen slowly in Uptown, but when you compare what it looked like not too long ago, it's astounding. Portrait image courtesy Friends of the Uptown. I was baptized in the Buena Presbyterian church in 1937. In 1967 my wife and I lived on Marine Dr. near Irving Park rd. We attended a Sunday service. Plaster from the ceiling had already begun to fall and only the right side of the sanctuary could be used. I attended Goudy school for a year;1949. A group of kids all went to the Uptown theater and called it a date. It was so grand. It is sad to see the decline in this area. Going back to old places of memory can sometimes be a sad experience. Does anyone remember the old Arcadia skating rink that burned down in the late 50s? I spent a fair amount of time there and wish I had a picture of it. In those days we used the camera sparingly since film and developing were so expensive so after the big fire, it was too late to get that one snapshot for posterity. It wasn't a spectacular building as so many were in the Uptown area but it performed a great function for those of us who loved skating. I skated at Arcadia every saturday. I showed up after the fire, and cried. I also went inside while it was smoldering out. Really missed that place.